Stunning pair of studs added to our diamond earring collection. These earrings are expertly crafted in solid 14K White Gold. Radiant with 1.50 ct. t.w. of genuine diamonds, these studs are high polished for a bright shine. Diamond Earrings 10K White Gold Round Cut Cluster Circle Studs 9.5mm | 1.50 CT.
New addition to our Jewelry For Less diamond studs collection. These particular earrings features round halo design. These earrings are set in real 10K White Gold. The White Diamonds are set in Pave Setting. Solid 14k white gold and excellent lab-created simulated diamonds. The 3-prong martini setting is distinctive and protective of the gem. Our gemstones replicate each array of light that a natural diamond does, comparable to D Color, VVS1 Clarity, & an Excellent Cut. New addition to our Jewelry For Less diamond studs collection is this well priced pair of earrings. These particular earrings features round diamonds in a pave setting forming an circle shape. The earrings are caged back for extra sturdiness and better quality.These earrings are set in real 10K yellow gold. Ladies Diamond Bracelets and Bangles. Ladies Pendants/Crosses. Diamond Earrings. Diamond Bracelets. Diamond Necklaces. Diamond Charms. Diamond Crosses/Jesus Pendants. Heart Shape. A pair of diamond studs is an essential indulgence for any lady or gentleman of bearing. Rarely have style and practicality co-existed in such harmony as in our stunning design. This beautiful pair of stud earrings encompass 2 princess cut diamonds weighing approx. Gram Weight. 1 round diamond 5.79x3.59mm. 1 round diamond 5.74x3.47mm. 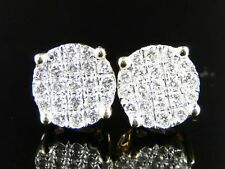 Diamonds earrings screwback. Diamond Information. Total Ct weight. Resizing and Fees. Stunning pair of studs added to our diamond earring collection. These earrings are expertly crafted in solid 10K White Gold. Radiant with 2 ct. t.w. of genuine diamonds, these studs are high polished for a lustrous shine. Style Hoop. Type Earrings. Main Stone Diamond. Diamond Color H-I. Main Stone Shape Round. Country/Region of Manufacture United States. Main Stone Creation Natural. Cut Very Good. Morganite Jewelry. Enhance your diamond or gemstone earrings with these 14k white gold diamond earring enhancers. All diamonds are set in solid 14k white gold and can fit 6-6.7mm round stones. 1.55Ct total diamond weight. 10K Yellow Gold Genuine Diamond Huggies Ladies Oval Hoop Earrings 0.95" 1.50 CT.
Color, sparkle and style combine to form these amazing huggie earrings. Crafted in precious 10K Yellow Gold, these earrings have a tiered design with a row of round diamonds graduating in size in the center with a halo of round diamonds around it. 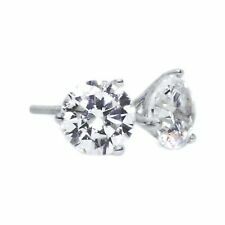 14K White Gold Princess & Round Diamond 3D Cube Stud 4 Prong Earrings 1.50 Ct. Simple and stylish, these earrings are crafted in 14K white gold. The width of the earrings are 7.75mm wide, making these a perfect gift for any occasion. Diamond Shape: Princess; Round. Style: Stud. Clarity:VS2 NOT ENHANCED. "Blood" Diamonds Conflict diamonds have funded devastating civil wars in Africa, ending millions of lives. Conflict diamonds, also known as "Blood diamonds". Best Dealz is a part of the Kimberly Process, all our diamonds are conflict free. Diamond (pronunciation: /?. m?nd/ or /?. Diamond is less stable than graphite, but the conversion rate from diamond to graphite is negligible at standard conditions. Diamond is renowned as a material with superlative physical qualities, most of which originate from the strong covalent bonding between its atoms. ). Total Round Black and White Diamonds Carat Weight -. 1.50 CTW (Clarity I1-I2 / Color Black & I-J). 10K White Gold Tapered Baguette Diamond Oval Hinged Hoop Dome Earrings 1.50 CT.
Color, sparkle and style combine to form these amazing diamond hoop earrings. Polished to a bright shine, all round and baguette cut diamonds are in a invisible and prong setting, making the overall appearance larger and lustrous. The width of the earrings are 9.50mm wide, making these a great size & a perfect gift for any occasion. Style: Stud. Diamond Shape: Round. When the manufacture makes errors, it can lead to a defect in the item stone setting. 14K -. 585. Color: Yellow. Near White. Very Few Spots W/Loupe. Color Stones Change (White Topaz, Blue Sapphire, Ruby etc). Want to add A personal touch to this piece?. Diamond Cut - Excellent. Diamond Type - Lab Created. Diamond Color - D.
14K White Gold Genuine Diamond Round Studs 10.75mm Circle Halo Earrings 1.50 Ct.
Beautiful pair of studs added to our Jewelry For Less studs / earrings collection. These diamond stud earrings are crafted in 14K White Gold with quad princess cut diamond in the center with a halo of round diamonds around it. Total Round Carat Diamond Weight is - 1.60 Carat. Gold Purity: 14k. EARRINGS WEIGHT IS 4.8 grams. Color Black and H-I. 1.50ct Aquamarine & Diamond Earring 14K White Gold Aquamarine Earring Pear Studs. Gemstone Wt. : 1.50ct Aquamarine (8x5mm each). Diamond & Gem Type: Natural. Diamond Details: 0.20ct, SI-GH. • 18k white / yellow gold. Ladies Necklaces. Browse All Ladies Chains. Earring Shape / Style. Ladies Pendants. Quality Diamond Jewelry For Less. Diamond Chains. Thesesolitaire dangle earrings will take your outfit to the next level. New addition to our Jewelry For Less diamond dangler collection. These particular earrings features a teardrop design. These earrings are set in real 14K White Gold. The White Diamonds are set in Pave Setting. 14K White Gold Princess Diamond Square Studs 4 Prong 9mm 3D Earrings 1.50 CT. Stunning pair of studs added to our Jewelry For Less collection. These earrings are expertly crafted in 14K White Gold with white princess cut diamonds in a square shape with prongs on each side of the square along with a row of round diamonds on the side. 14K Yellow Gold Real Princess Diamond Studs 10.10mm Square Earrings 1.50 Ct. Stunning pair of studs added to our Jewelry For Less collection. These earrings are expertly crafted in 14k yellow gold and showcases real diamonds. Radiant with 1.50 ct. total weight of diamonds, these studs are high polished for a bright shine. 10K Yellow Gold Diamond One Row Bezel Set 1.55" Hoops Huggie Earrings 1.50 CT.
Polished to a bright shine, all round cut diamonds are in abezel setting, making the overall appearance larger and lustrous. These earrings secure comfortably with snap / hinged closure backing for secure wear. 10K Yellow Gold Baguette Diamond Huggie Ladies Oval Hoop Earrings 1.00" 1.50 CT.
Color, sparkle and style combine to form these amazing huggie earrings. Crafted in precious 10K Yellow Gold, these earrings have a beautiful row of baguette diamonds in the center with a row of round diamonds on each side. Set in14k White Gold, this beautiful piece of jewelry is available in your choice ofWhite or Yellow Gold. Each earrings features solitaire round cut stones set securely in a prong setting and totaling1.50ct. 10K Yellow Gold Tapered Baguette Diamond Oval Hinged Hoop Dome Earrings 1.50 CT.
14K White Gold Brown Diamond Flower Studs Square Halo 9mm Earrings 1.50 CT. Stunning pair of studs added to our Jewelry For Less collection. These earrings are expertly crafted in 14K White Gold with a cluster of brown diamonds in the center and a halo of white diamonds around it. Gorgeous pair of earrings in 10K White Gold. The earrings consist of genuine diamonds all set in a pave setting. The pave setting allows no prongs to be seen in the setting and the diamonds to reflect off each other. 18K White Gold RoundDiamond Dangling Teardrop Butterfly Back Earrings. 18K white gold earrings weighs 8.2g together. Diamond I color I1 clarity. 210 round cut diamonds, total weight about 2.00ct. Stunning pair of studs added to our Jewelry For Less collection. These earrings are expertly crafted in 14K yellow gold and showcases brown diamond center & white diamond halo earrings. Radiant with 1.50 ct. total weight of diamonds. Certificate:GEL CERTIFIED AND APPRAISED. Type:ROUND CUT. MAIN STONE. Setting:14K WHITE GOLD SCREW BACK SETTINGS. Gold Weight:1.00 GRAMS. These beautiful earrings are made out of great quality 14k white gold with white round cut diamonds set in a prong setting. These earrings have a distinctive shine effect with its beautiful clean style dangle heart design.